Hello and welcome to Monkey Music! 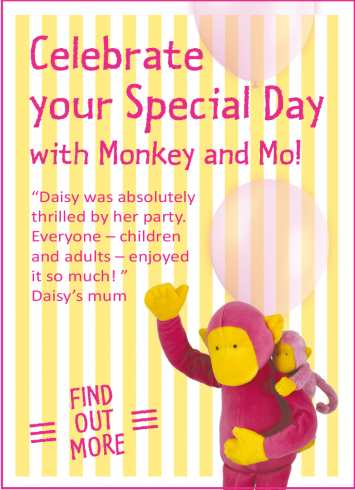 We are Kate and Melissa and we are very excited to bring you classes in Harpenden and St Albans, We both thoroughly enjoyed attending Monkey Music classes with our own children; they loved playing all the real musical instruments and investigating the colourful props and they still enjoy the songs today! Monkey Music is a very social activity for the parents too and classes are a friendly and welcoming place to meet new friends. There are cafes within easy reach of all our venues so you can enjoy time together afterwards too. We are passionate about developing children’s natural musicality and we aim to make Monkey Music not only the highlight of the child’s week but also that of the parent, grandparent or carer. 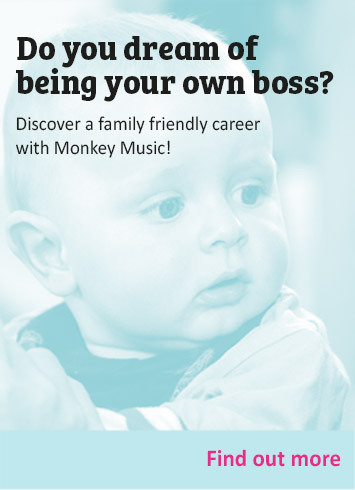 Back in 1997, Monkey Music groups for babies and toddlers at Harpenden Musicale were the very first of the classes to be launched outside London, and Harpenden remains the heartland of Monkey Music, being the home of our Head Office. We continue to enjoy a close association with Harpenden Musicale and many of our little monkeys continue with their music lessons at Musicale when they start school. Indeed our daughters are two of them! We welcome families from the wider Hertfordshire area too. So whether you’re looking for children’s activities in Redbourn, Wheathampstead, Markyate, Flamstead, London Colney or Hatfield, we’d be delighted to hear from you. Every week is different at Monkey Music! There are over 500 original and traditional songs, a huge variety of interesting props and real instruments used in the classes that are held throughout the UK. The thing we believe that makes Monkey Music different though is the progressive nature of each of the four curricula that build on each other and meet the developmental needs of the babies and children at each stage. The curriculum provides an engaging, fun and structured introduction to music and singing at whatever stage they join Monkey Music. Babies can start Rock‘n’Roll classes from three months and the curriculum is based around developing their sense of the world around them and understanding cause and effect. We have specialist instruments designed for tiny hands and the first shake of a maraca is a big moment! Songs about everyday activities help babies understand what is going on around them and give parents and carers lovely songs to sing at home during daily life. Magical lullabies, gentle unusual sounds, bubbles and sensory props capture their attention and light up their eyes. When babies are about one year old and start to move, they are ready for Heigh-Ho classes, which have been designed for toddlers up to two years old. The classes are fast and energetic to match this fun and action-packed age. There is developed instrument playing, including the introduction of beaters to the drums and learning to stop and start on cue to the music. They explore the space around them and start to learn to share with their friends. There is lots of singing, moving and dancing with themes and repetition that encourage toddlers to communicate with their carers and develop their gross motor skills in clapping to rhythms and dancing to songs they know and love. Jiggety-Jig classes are designed for two and three year olds to explore musical activities in more detail and join in a bit more independently from their parents. Everyone is still encouraged to sing and play along together and more complex concepts are introduced such as listening and interpreting the music, taking turns and singing together. Our Ding-Dong pre-school classes are for three and four year olds to start learning to read music and experience using the instruments of the orchestra for the first time. Our teachers encourage the children to be more independent of their carer to help prepare them for the next stage of formal nursery or school. Children start learning to compose, sing and listen in groups and on their own. They gain confidence in following instructions carefully, playing the instruments sensitively and performing independently in front of the group and taking turns. Our class sizes are small and grouped according to age, meaning that each 30-minute class is packed full of new learning opportunities and not a moment is wasted! New topics are explored every other week using different props and songs. Each class contains singing, a movement/dance section and playing of percussion instruments. A FULL instrument kit means that every child is given an appropriate instrument necessary for making music rather than just ‘a noise’! Our classes are very interactive, we encourage parents and carers to join in with their children. They are a great chance for you to spend some special time together, the more you get involved the more you gain from the experience. The Monkey Music class experience also extends beyond the 30-minute sessions as parents and carers go home armed with lots of music knowledge and ideas! Our teachers are trained and assessed nationally before being authorised to teach Monkey Music classes and receive ongoing training and support on the curriculum. We would love to welcome you to one of our classes and your first one is complimentary so you can experience the fun and magic of Monkey Music for yourself! If you have any questions or would like to talk about which stage would be best for your child, please do feel free to contact us. We would love to hear from you and introduce you to our teachers and other local mums, dads, babies and toddlers in the Harpenden and St. Albans area. Classes are currently held in Harpenden and St Albans and we will also be opening new sessions in the future covering the areas of Fleetville, Redbourn, Wheathampstead and Sandridge. "Anne Marie is a lovely teacher with an extraordinary amount of patience with the toddling little ones who go walk about whenever they fancy it!" We arranged a Monkey Music party at home to celebrate my son's first birthday. It was just perfect, and everyone had a brilliant time! 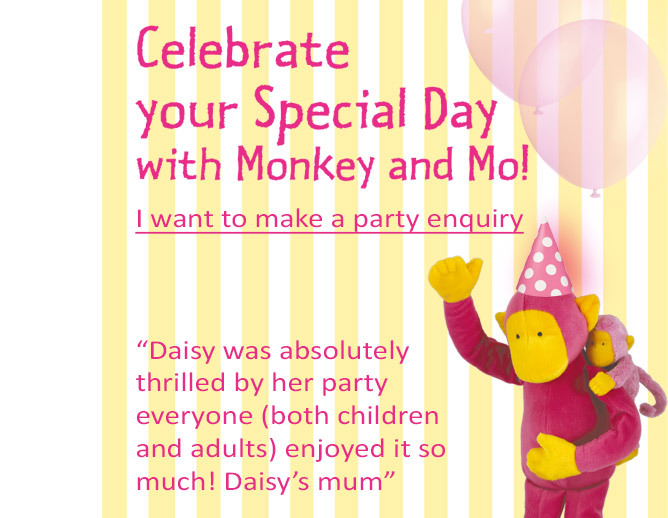 I wouldn't hesitate to recommend a Monkey Music party! 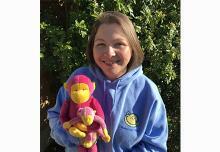 Kate teaches in St Albans and is delighted to bring classes to the area where she first discovered the magic of Monkey Music with her own children. She brings great energy and a passion for introducing children to the exciting and rewarding world of learning with music, laughter and special moments. Lucy has a BA HONS from the Italia Conti Academy of Theatre Arts and performed in the West End before becoming a mum. She and her children became big fans of Monkey Music at Anne Marie's classes. Lucy is a natural teacher and loves sharing the magic of music education with local families. Booking for Summer Term 2019 now open! Classes start back on Wednesday 24th April in Harpenden and St Albans!